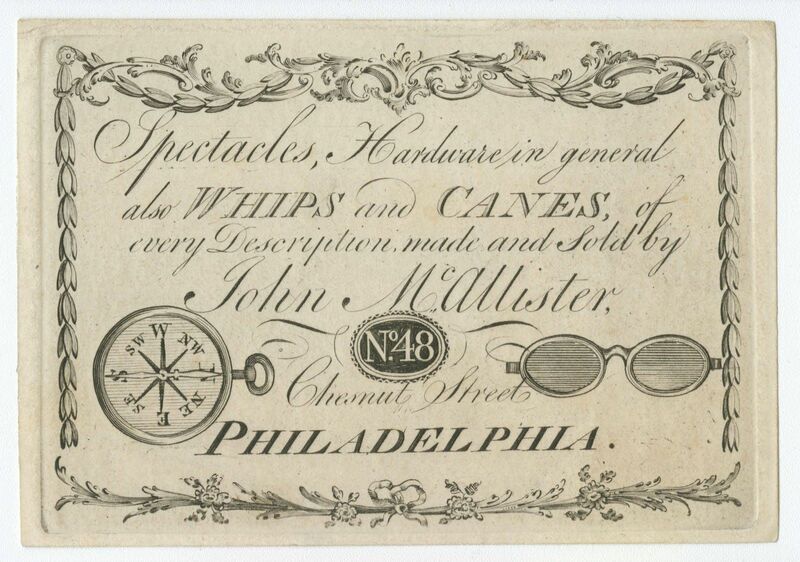 While living in Philadelphia John McAllister Sr. showed incredible entrepreneurship by becoming a successful whip and cane manufacturer. In fact, it was due to this entrepreneurial spirit that he was able to earn a permanent spot in optometric history. 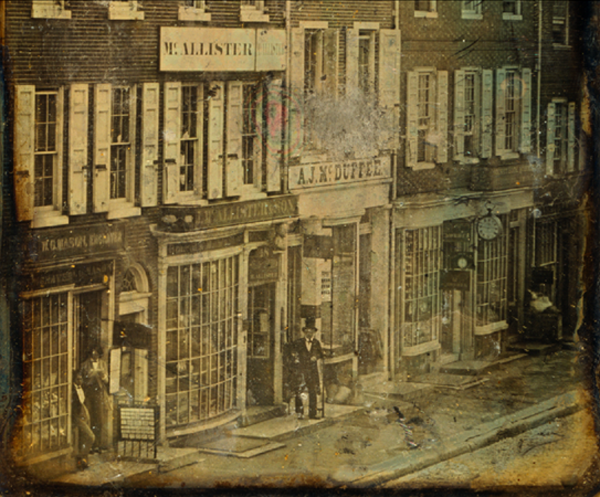 Let's review the life of John McCallister and how him opening the first US shop for optometric services changed the face of optometry. John McAllister Sr. was born in 1753 and immigrated to the United States from Scotland in 1775. Once settled, he started a successful whip and cane manufacturing business. Soon thereafter however he realized that his profession was going to change, most notably after purchasing a stock of spectacle frames in 1796. This side interest in spectacles ultimately became his main professional and business focus, eclipsing his earlier specialty. After opening the John McAllister firm there was no looking back. The firm became nationally recognized as specializing in everything optical. This included optical equipment, vision correction tools, mathematical instruments, and commercial photographs. The firm manufactured a variety of spectacle frames, that were versatile in nature and that allowed an individual the ability to easily change the lenses within their frames. The firm also advertised selling a variety of frames manufactured of gold, silver, and even steel All of these could be equipped with concave, convex or green lenses to correct specific vision disorders. Even Thomas Jefferson used John McAllister to manufacture and supply his personal spectacles. In 1807 John McAllister's son John McAllister Jr. graduated from the University of Pennsylvania and joined his father's business. 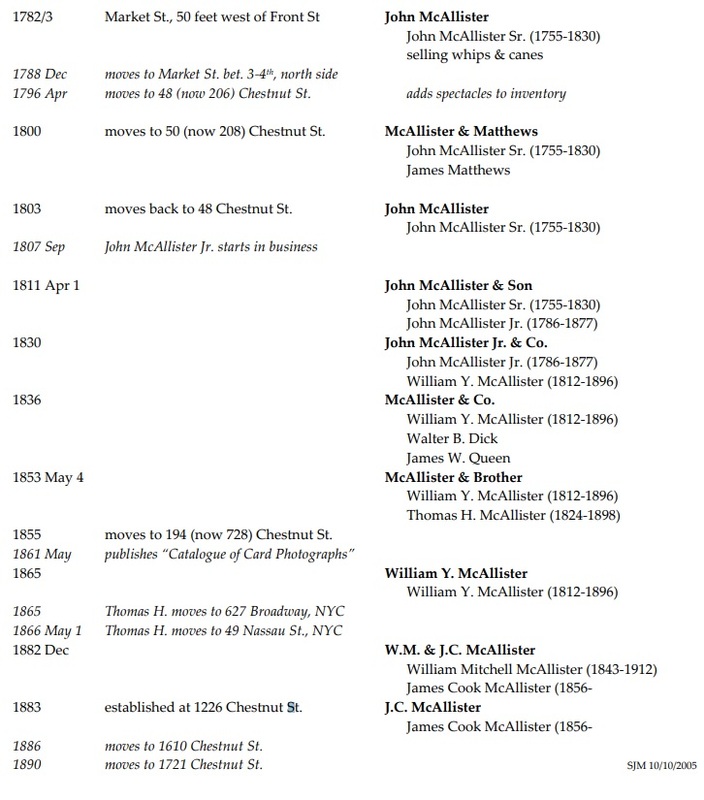 In 1811 his son became a partner and the name of the firm was changed to John McAllister & Son. John McAllister Sr. eventually handed the business down to his son, after which it remained in family hands for decades even though the name of the firm itself changed several times. Some even venture to say that the company may have played a valuable role in documenting the civil war through its various letters and portraits of servicemen. John McAllister Sr. passed away in 1830, but his drive for success fed by his unyielding entrepreneurial capacity as an entrepreneur created a family business that lasted for over a century. It's legacy still has an impact even today.